iPROM’s data on ads served in 2017 shows that the number of displayed ads grew across all industries. iPROM has been measuring the number of ads served through digital media since 2005. Last year, direct clients, agents and media buyers relied on iPROM’s infrastructure to carry out 15,103 advertising campaigns, an increase of 16.20% over 2016. These campaigns were used to deliver 46,106 different advertising messages, recording an increase of 15.12% compared to 2016. With 17% market share, the retail industry took the lead in terms of the number of displayed ads In 2017, the retail industry recorded 5.57% growth and took the top spot for the first time with 17.05% share. The second place was taken by the leisure and entertainment industry with 12.69% share of the market. The automotive industry, which was the leading advertiser in 2016, fell to third place after capturing 12.16% share in 2017.
iPROM recorded significant growth of the telecommunication industry share, which took the seventh spot among the largest advertisers in 2016 and achieved 87% year-on-year growth in 2017. »iPROM’s data for the past year shows that investments into digital advertising in Slovenia are growing. 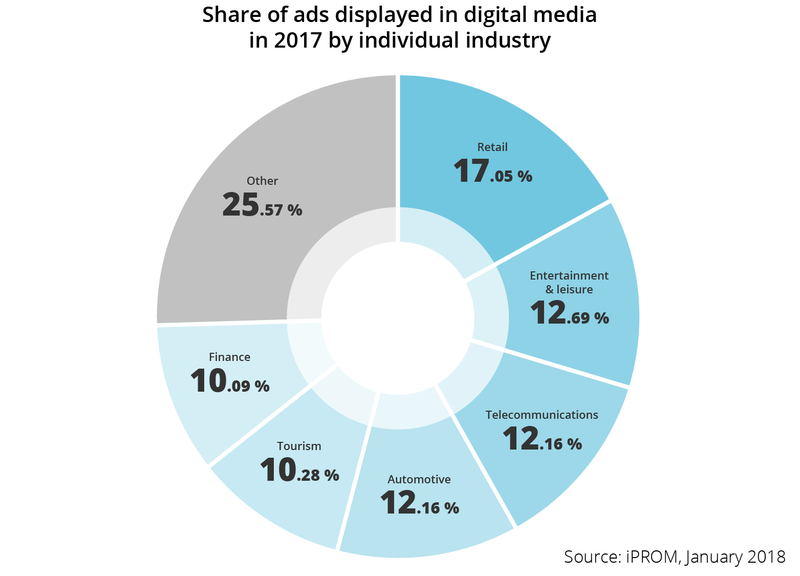 Data from the AdEx Benchmark that is led by IAB in Slovenia shows that digital media advertising represents a quarter of all advertising budgets,« Andrej Ivanec, Digital Planning Director, iPROM, commented the results.